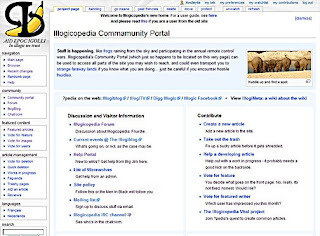 Part of the second Article Improvement Drive is the campaign to prettify some of Illogicopedia's more prominent pages, including those linked to from the front page and the sidebar. It is planned that this will give us more of an identity and further separate us from the old wiki - hopefully we left all the "childish and juvenile" connotations behind when we left W*kia. Well, the Site-Wide Improvement Drive™ is underway. I completed a new version of the Browse page but some of the categories still need streamlining - this will be done in due course. Probably. By the way, I pinched and tweaked the design from Wikipedia's Topics Index... you might have guessed by now that that's the best way to create 'new' designs. The Community Portal (pictured) has been given a lick of paint, too... how blue. Next up are the Featured Articles Portal and maybe the Help section. If anybody wants to give it a go, please do - make a rough version in your userspace and we'll probably be able to settle on something. Ultimately, it is hoped the front page will also be completely revamped, though it's difficult to settle on something definite.